Thanks Eddie, for this great information and comments. This must be a disease of the intellects*?? in that they will continue to study the most obvious while thousands die. Even more disturbing is the fact, as you say, that they ignored B6 which is germane for any meaningful assessment of homocysteine (Hcy) and these are the experts* we are supposed follow.... Or is this just the price one has to pay while they usurp more and more funding for all those useless ongoing studies? What I don't understand is that they could continue the studies while fortifying the food but choose not to or overlook it. It only took them a few hundred years to figure that lack of Vitamin C leads to scurvy! All this leads to one thing, that is: if there is no money in it, it just does not get done. Statins anyone? Totally mad! * "Science became an educated cadaver of thought, above which congregate expert players. If the encyclopedia of the ignorance of the acknowledged authorities in the history were to be published, it would number many fat volumes. Nothing will interest scientists anymore. They are like oxen which feed of fenced-off pasture." Well, there is indeed 'knowingly' but many don't realize the awful situation when 2 young populations [slum and not] are at homocysteine levels of 22 [and at the extreme low levels of the only 2 vitamins measured]. Researchers in Rotterdam glanced over this level of 22 in an elderly on 'meals on wheels' study and ditto in Framingham Bostonians over age 90 [and where levels of under 6 also were found, but the mean was 22]. The bulk of physicians have no idea of the value of Hcy as a marker better than a rectal thermometer about a patient's state of health, and 'scientists' still debate if Hcy is the cause of anything. I have no doubt that in the Indian context Hcy could be halved by flour/grain product fortification with B2, B6, folate and B12 and this probably for a cost approaching $0.10/year if done at the food plant and required by gov't. Europeans are not adding these nutrients either -and the 'scientists' are busy debating theoretical 'harm' while asking for more studies ... while Rome burns! The moral: get a cheap multivitamin to all who want one, and to those who cannot afford it, make it available at clinics and health / community centers at cost or free, it's that cheap. > Thanks Eddie, that is a great demonstration (and needs more exposure) on > how the medical community knowingly allows heart disease to spread! The vegetarians did marginally even worse than non-vegetarians in the B12 and folate department, with sky high homocysteine that has to be a national scandal: about 22 in people in their twenties. B6, a massive contributor, not analyzed. dietary allowance for Asian Indians . 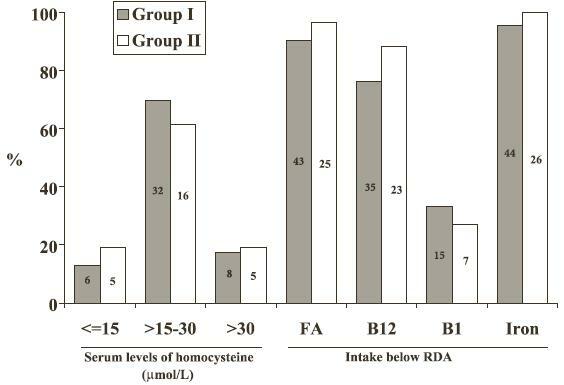 .....The data of uniformly high levels of serum Hcy in urban dwellers, irrespective of the socio-economic class, raises significant concern, suggesting urgent employment of low-cost strategies for prevention of atherosclerosis and its complications in this semi-literate and illiterate popu lation. First a nd f oremost is t o spread awareness about balanced nutrition and increased intake of fruits and vegetables. In addition, fortification of food materials with folate (e. g., grains [52, 53] and flour ), and its provision to people of low socio-economic strata at a subsidized cost should be considered in the National health policy. Cobalamin supplementation could also be considered for the CHD prevention in the population subgroups [43, 53], particularly in the developing countries where its deficiency is widespread . These simple, inexpensive and effective interventions hold promise for reducing CHD prevalence and for simultaneous prevention of several vitamin deficiencyrelated disorders . Micronutrients supplementation program and policy in India does not include such an option yet . Complete paper "Hyperhomocysteinemia, & low intakes of folic acid & vitamin B12 in urban North India" is here.